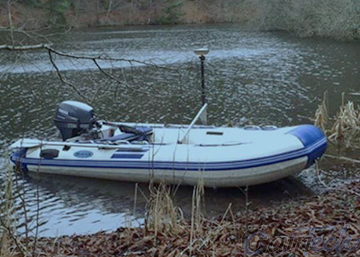 Caintech offers a range of bathymetric survey services. This can range from river bed surveys to lagoons and lochs. Dedicated survey vessels are fitted with single beam echo sounder technology. Caintech utilise a manned inflatable boat and outboard motor with custom made mountings for our single beam echo sounder and GPS equipment. 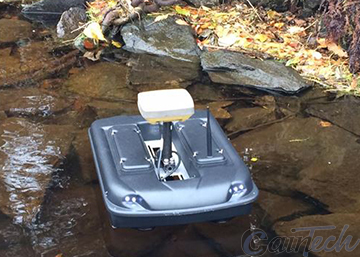 This allows us to survey large areas of water body's efficiently and accurately. We also have a custom made Radio Controlled Sonar boat that was built in house to meet our requirements. This allows us to survey areas where it would be difficult to access with a full size boat. The "sonar boat" can easily be carried in a large rucksack which is ideal for carrying along a river bank when carrying out river cross sections. We have the option of mounting our RTK GPS Rover connected to the echo sounder or using a robotic total station with a prism mounted on the sonar boat. This allows us to survey under bridges or in tight areas where there would be limited GPS Coverage. 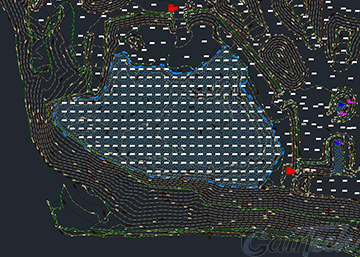 Our survey procedures have been developed to allow us to safely survey underwater features and merge them with traditional topographical surveys to give a complete survey to the client. At Caintech we pride ourselves with working with the end user to tailor the survey to their requirements.